On Tuesday, I had conferences, which went pretty well by the way, and the children made the "baskets" we would use for our Easter party. I have to confess I was not there when they made them, but they look like they did a great job with them. I always think they are so cute lounging around the room waiting for our Easter party. I run the paper with the ears and mouth off on some construction paper. I then give one to each child. If they are good cutters I will let them cut out both pieces. Usually we are running low on time and the mouth area is harder to cut, so I let the children cut out the ears while I cut the mouth. I then have them take a pink marker and color the inside of the bunny's ears pink. The remaining steps are all decorative. 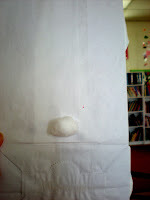 The children glue the ears and mouth on the paper bag. We then use tacky to glue on the wiggle eyes, pink pom pom nose, and a cotton ball tail on the back. For whiskers I usually hit the scrap bin and we just cut some strips and glue them on. 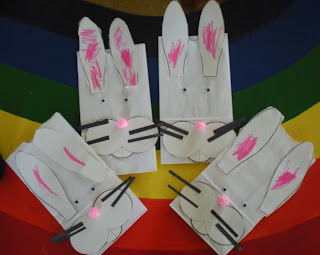 We then place them around the room and hope the bunny will fill them on party day. 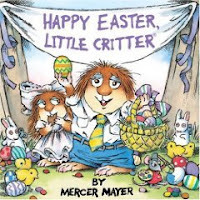 The book I had them read today was "Happy Easter Little Critter," by Mercer Mayer. I must admit I am a bit of a Little Critter fan. My son was doing a book drive and asked if he could take some with him. Well, I just can't part with them. I'll probably by seventy years old, in my rocking chair, enjoying my Little Critter books. We all have our favorites. We love Little Critter books. I don't think you can ever be too old to enjoy them. Cute bunny bags too!